In June, Give an Hour™ announced two demonstration projects of the Community Blueprint, a collaborative effort to help communities address the needs of veterans and military families on a local level. Admiral Michael G. Mullen, Chairman of the Joint Chiefs of Staff, spoke at the announcement of the projects, held at the Women in Military Service Memorial in Washington, D.C. The event included a discussion about the need for communities to support and assist military families in their area.On the panel were Mr. Rob Gordon, Deputy Assistant Secretary of Defense; Ms. Tracy Hoover, Chief of Staff for Points of Light; Mr. Jim Lorraine, Executive Director of Central Savannah River Area - Wounded Warrior Care Project; and Mrs. Deborah Mullen, military advocate and wife of Adm. Mullen.Mark Thompson of Time magazine facilitated the discussion. The Bristol-Myers Squibb Foundation has awarded Give an Hour™ a $2 million grant for the demonstration projects in Norfolk, Va., and Fayetteville, N.C. The Walmart Foundation has committed $144,000 in support of the program, which will be used to provide grants to a total of 16 local organizations in Norfolk and Fayetteville, with the goal of improving the services they deliver to the military community. These organizations will be eligible to apply for grants of up to $15,000. There is universal public support for service members, veterans, and their families. Federal, state, and local governments, as well as nonprofit, private, and philanthropic resources and services, have grown and improved in communities across the Unites States. But supporting veterans, service members, and their families is about ensuring that communities are prepared to organize the resources and services that help military families lead healthy, successful lives. There remain significant gaps in services and a great deal of untapped potential for providing effective and sustainable care through focused planning and coordination. To address these needs by leveraging the combined experience and expertise of collaborating organizations, volunteers from several leading nonprofits are creating an online Community Blueprint tool that will help local community leaders assess and improve their community's support for veterans, service members, and their families. The nonprofits on the Community Blueprint Advisory Council cover a wide range of areas of focus and expertise: American Legion Auxiliary, American Red Cross, America's Promise Alliance, Armed Forces Services Corporation, Blue Star Families, Give an Hour™, Military Child Education Coalition, Military Officers Association of America, National Military Family Association, Operation Homefront, Points of Light Institute/HandsOn Network, ServiceNation: Mission Serve, the Tragedy Assistance Program for Survivors, and the Veterans' Innovation Center. With the grant from the Bristol-Myers Squibb Foundation, Give an Hour™ will lead the implementation of the Community Blueprint in the demonstration cities.Give an Hour™ is inviting local and national organizations to help implement the program and to evaluate successes. "War has both short-term and long-term consequences that can influence the emotional and physical health of returning veterans and their family members for many years to come. There are a multitude of resources available to soldiers and their families, but in many instances these resources are disconnected and underutilized," says John Damonti, president of the Bristol-Myers Squibb Foundation. "Strategic, coordinated community partnerships can support the military in its efforts to address this important issue. The Community Blueprint will guide community leaders, local governments, and the military as they work together to develop the supportive communities that our veterans and their families deserve." "We are grateful for the generosity of the Bristol-Myers Squibb Foundation and to Walmart for recognizing the importance of harnessing the goodwill of communities in supporting the military families who are left behind when their service members deploy and in supporting the service members as they return home," said Dr. Barbara Van Dahlen, founder and president of Give an Hour™. "This kind of support, we've found, is critical to the successful reintegration of military families back into their communities.These grants will help us to evaluate vital services and highlight innovative examples, ensuring they are available and easily accessible to military men and women and families, wherever they live." 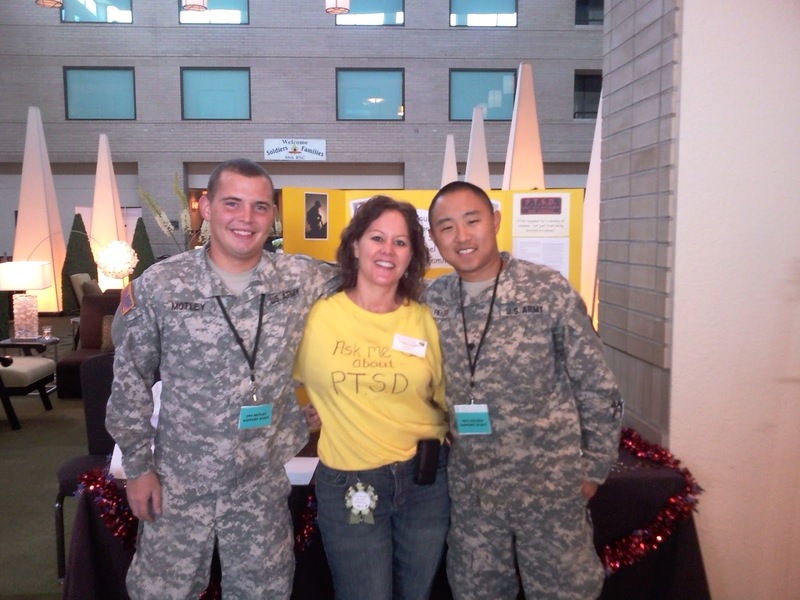 One of our providers, Kami Himes, at the GAH table Schaumburg, IL Yellow Ribbon event. There were approximate 1,000 USAR Soldiers and family members recently deployed or about to deploy at this event. Kami set out GAH brochures and wallet cards, made the board and set up that table with her own ingenuity. She and seven other volunteer providers stepped up to cover this event. Kami and Barb Gillett are also Military Family Life Consultants (MFLC) as well as GAH providers. This is GAH's first Yellow Ribbon with the 88th RSC, and we hope to do many more in the midwest and across the country.